“Benjamin Harrison” is Charles Calhoun‘s 2005 biography of the 23rd president. Calhoun is a professor at East Carolina University and the author of several books focused on the late nineteenth century. He is reportedly working on a biography of Ulysses S. Grant. As the ninth member of The American Presidents Series I’ve read, “Benjamin Harrison” held few surprises. These biographies are generally well-edited and efficient with a reader’s time, and this was no exception. Lacking the breadth of more complete biographies, I tend to rely on this series for the obscure, forgotten or maligned presidents where short-and-sweet may be ideal. Of all the presidents Calhoun could have been tasked with covering, Benjamin Harrison would seem to have been among the least enticing. But it is a task to which Calhoun is well-suited given his professional focus on Harrison’s era. And to his credit he produced a straightforward and extremely readable biography of this quietly competent, if terribly unexciting, president. Calhoun’s primary thesis is fairly bold: that Harrison was an activist president who paved the way for the “modern presidency.” Legislatively, much was accomplished during Harrison’s term – and Calhoun rarely fails to credit him with this fact. Largely unmentioned, however, is that many of the freshly-minted laws were widely unpopular or ineffective and later abandoned. But Calhoun’s advocacy generally proves convincing nevertheless. As a biography, “Benjamin Harrison” is comprehensive and well-paced. In addition to thoroughly reviewing Harrison’s political career, it provides reasonable coverage of his early life as well as his post-presidency. But while there is some effort to address his legacy, I would have appreciated much deeper insight into history’s treatment of Harrison – particularly since Calhoun makes such a concerted effort to elevate his presidency. And despite a few attempts to humanize Harrison, this biography’s subject remains an impassive stone-faced figure from beginning to end. The description of Harrison’s late-life romance with his deceased-wife’s niece provides the book’s first real animation of the former president. But this comes so late in the biography that the reader has already given up hope of meeting a flesh-and-blood human. Coverage of Harrison’s presidency itself feels appropriately paced and penetrating for a biography of this type. But, unfortunately, the topics of importance during Harrison’s administration (principally the import tariff, currency issues and foreign affairs) prove relatively uninteresting. The relative brevity of the biography saves the reader from uncomfortable drudgery, but Calhoun fails to explain the issues in a way that overcomes the inherent sense of tedium and complexity. 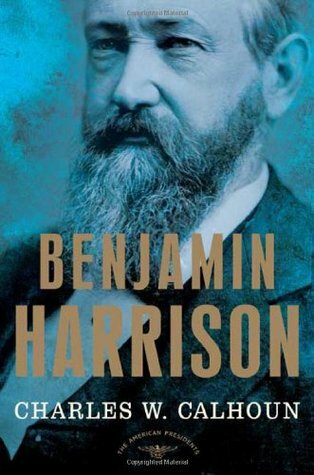 Overall, Charles Calhoun’s “Benjamin Harrison” is a useful biography of this unexciting president; but like Harrison himself, it occasionally feels dull and flat. Some of the blame certainly rests with Harrison, whose lusterless personality and forgettable presidency makes him a difficult subject. But while this biography is fairly successful at explaining Harrison’s public life, it falls short of fully revealing the man or explaining his place in history.